Traxxas X-MAXX 8S Aluminum Rear Axle Carriers (2 PCS). Bullet proof your ride with these heavy duty carriers. 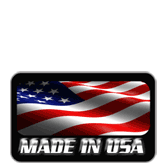 Machined in the USA from solid American made 6061 T6 Aluminum. These are a direct replacement for the Traxxas part no. TRA7752. We start from a solid chunk of aluminum and machine every side for a perfect fit. Bearing ridges are precision sized for that perfect snap in fit eliminating any slop in the suspension. Hinge pin holes are sized for the tightest fit to eliminate any wobble. No need to shim or worry about wear and tear on these. FFRC Logo is then laser engraved for a nice finish. These are not cast like some of the cheap import versions. These are fully machined from a solid chunk of American made aluminum! You are buying quality here. Fits the Traxxas X-MAXX 8S and 6S trucks! The carriers were a simple install, look great and are a must to go with the A-arms. I am very pleased with the set up. The fit and finish are excellent. The bearing and hinge pin surfaces are just right. I highly recommend.